Happy April, everyone--enjoying your "spring" so far? I say that a bit sarcastically because here in western Pennsylvania, we are still getting snow flurries from time to time. In fact, I spotted a few this afternoon... Yes, it IS April 16th, but it feels more like early November weather here. We had a taste of very nice 70°+ weather over the weekend, but it quickly vanished into gray skies, rain, and a bit of snow here and there. But, things are looking up--the forsythia is blooming along with the daffodils (well, those that haven't been eaten by the deer, that is!). The birds are returning and the grass is greening up beautifully! I have a couple of finishes to share with you today--one big (for me!) and one small. The first is by La D Da and is called "Cherry Picker." It is stitched on 40 ct. pearled barley by Lakeside Linens--a new fabric for me as I generally use 40 ct. Newcastle. But, I enjoyed it very much--just wish the pretty taupey color of the fabric showed up a bit better in my photos. I used most of the suggested colors, but substituted GAST Country Redwood for the suggested red of the cherries. I also changed the color of the leaves to DMC 934 and 936. The charted leaves in the middle were black and that just didn't appeal to me at all! What drew me to this piece (in addition to the cute blackbird carrying his little, red cherry) was that gorgeous alphabet. I think this may be one of the prettiest charted alphabets I've ever seen, don't you agree? I sure wish I could write like this--just look at that stylized F and the beautiful Q and Z! I am someone who almost always prints except when I have to sign a check or legal document so I truly appreciate beautiful handwriting. Don't you love this alphabet? I had an issue with the colors of two skeins of DMC, believe it or not! It taught me a lesson, though--start with a fuller skein if you have a large area to stitch. If you look closely you'll see the top 2 1/2 rows of the lighter squares in the basket are darker than the remaining squares. Apparently, my new skein of DMC 612 was lighter than the older skein! I noticed it immediately, but decided there was no way I was going to run off to the store to look for a matching skein--it is a basket after all and they usually have imperfections in colors or the actual weaving. So, it's fine--I'm glad I let my inner perfectionist go this time! I plan on framing this one--it is long and thin, though, so I'll have to figure out where in the house it will fit best. Look closely--you'll notice that the DMC 612 in the basket is two different colors! Next up is my small finish--my Christmas ornament for April. Isn't this Santa adorable with his little pigeon-toed feet? And the tiny reindeer--darling! This is called "St. Noel" and is a design from With Thy Needle & Thread which I stitched "over one" on 28 ct. bay leaf Jobelan. I had trouble getting the white to show up so I switched the suggested color from ecru to B5200 and stitched the top of each cross stitch twice. That seemed to do the trick! I also switched the red to DMC 221 and the face color to DMC 407. "St. Noel" finish--such a joyful guy! I fully finished the ornament this past weekend and love the final result... I combined two fabrics, a strand of homemade cording and a burgundy colored button to accent the stitching. The back of the ornament is also the burgundy and white checked fabric. So, on to my May ornament which I began last night... I'm so pleased to be on track this year with my monthly ornament finishes! In other stitching news, I've received some lovely gifts which I'd like to share with you. First of all, I won a giveaway from Arlene at Nanaland. She was offering this cute patriotic chart and when it arrived, I found Arlene had also included a skein of the prettiest spring-colored thread from Colour & Cotton. I'm anxious to try it--it looks wonderful! I hope to stitch up "Land I Love" by Memorial Day and will then offer it as a giveaway right here--so watch for it... Thank you so very much, Arlene! And from another of my readers (who doesn't want to be identified), I received a large package of charts that she said I can either keep and stitch or use as giveaways. Wasn't that sweet? I was so touched by her kindness and her desire to see these charts go to fellow stitchers. 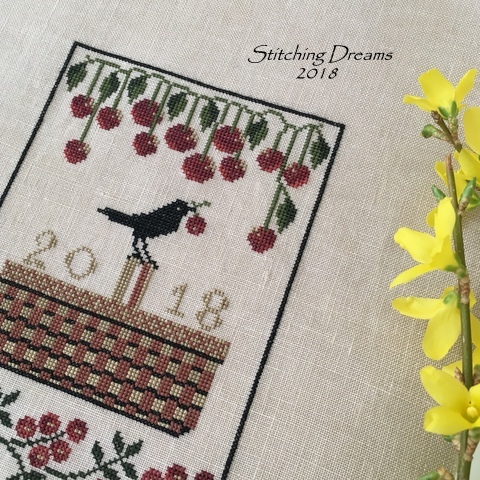 Thank you so much, my friend--I see several that I'll be adding to my stitching line-up and I know those of you who win some of these charts in future giveaways will be most appreciative as well. A wonderful grouping of charts from a blog reader and friend! In the baking department... Easter brought another baking opportunity and the result was this tasty Strawberries 'n' Cream Cake Roll from Sally's Baking Addiction. I was a bit nervous about making this, but the instructions were so clear that it came together very easily... It used freeze dried strawberries which gave the filling a very intense strawberry flavor. My middle son, who is usually not a dessert eater, even had seconds! I think the bunnies wish they could taste some! Easter marked the end of my sweets baking for a while as we have no holidays until Memorial Day. But, that doesn't mean the bread-making stops! Sunday found this wonderful Multigrain Bread on our table... Very, very tasty--a great bread to serve with soup and a salad for a simple dinner. I used the multigrain hot cereal from Trader Joe's and added only 2 teaspoons of yeast. Next time, I would cut the salt to 1 teaspoon, too--it tasted just a bit too salty for me! Little visitors... I think that's about it for today... I hope to be back at the end of April if I have any finishes to share. Until then here are two sweet visitors (well, the squirrel is just a bit naughty, if truth be told!) who frequent our bird feeders. Poor squirrel--he spends much of his time perched on that rock looking longingly at the suet feeder! La d Da designs have a certain elegance to them - they never date. So many lovely things to see Carol - both edible and stitched. I agree about the weather - we're just not getting into Spring either. Hopefully it will show up soon. What absolutely beautiful stitching as usual! Your cherry sampler is adorable and I agree with you about the alphabet...it is truly one of the nicest I have seen. And that Santa!!!! He is another adorable one! I hope Spring weather will return to you shortly...your little visitors are just precious! I always love seeing an update from you. Two beautiful finishes. I agree with you about how pretty the alphabet is on the Cherry piece. Yet again a beautiful finish on St Noel of course. Land I Love is a beautiful piece. That new thread is delicious looking as well as your yummy cake roll and bread. Wow a wonderful pile of goodies in the charts you received. I look forward to seeing which ones you add to your to do list. Have a great week! Love your finishes, Carol! I feel inspired to finish some of mine. Weather-wise here, I'm waiting for the wind to pick up my house and place it in the next county! Very windy here. The cake looks very tasty; heck, anything with sugar looks tasty! I'm trying to eat healthier. Take care! I hope Spring arrives soon for all of you in the north and northeast. Cherry Picker and the Santa are great finishes. Never saw either design. I have had problems with the 610 and 644 series being different. Along with a bunch of others! I have gained 10 pounds and should not be looking at bread recipes but I may look this one up. "Cherry Picker" does have a truly lovely alphabet. Normally stitching alphabets are 'work' for me, but this one looks like it would be interesting to stitch. Your Christmas ornament finish is charming. Wonderful to see a Carolina Wren. I have two wren houses up, but no occupants so far. Carol, this post just ticks all the boxes for me! Gorgeous stitching - tick! Christmas Ornament - tick! Another example of your exquisite finishing - tick! Lovely baking - tick! A chance in the future to possibly win a patriotic stitching design - tick! And some furry and feathered friends - tick! Just perfect! thanks for sharing. Love the cherries sampler , I love anything to do with cherries just love this fruit . Cute Christmas stitch love the finish .The cake and bread look so yummy too . Don't you just love the wren such a sweet bird . Great gift's what great charts . Enjoy your week , hoping your Spring will arrive this week hugs. That really is a lovely alphabet on your cherry picking design. It is so frustrating when colours don't match up!! No wonder that you spread a bit of sarcasm when you write about your spring weather. It seems that winter has come back so some parts of the US with cold and several inches of snow. At least that's what I can read on several blogs. I hope for you that spring has finally sprung in your region and that you can enjoy spring temperatures and flowers soon. Quite certainly you have enjoyed your stitching lately. The Cherry Picker is such a cute design. And so is your new ornament pick. And a wonderful finishing. I have noticed the same about older and newer DMC colours - some colours are different and you can't use two different skeins when you are doing some block stitching. No idea why and when this happened. But it can be annoying when you realize it too late. Your baking looks so delicious, both the bread and the cake. I used to make bread when the children were still at home. And back then I also used to make cakes on a regular basis. But since it's only the two of us left at home I don't do it any longer. Beautiful cross-stitch work and such gorgeous patterns! Your Strawberries 'n' Cream Roll looks wonderful and your homemade bread (which I also love to bake) looks delicious too! Lovely to see the birds and your naughty squirrel! your Cherrie Sampler looks wonderful. I love the alphabet. So many beautiful charts from a blogfriend. The strawberrierscreme cake looks very yummy. I hope the spring is comming to you, soon. Both stitches are adorable and I love the finish on the ornament. The cake and bread look so yummy. Homemade bread is the best! I love birds. I have a pair of cardinals who hang outside my sewing room window. I just love to watch them. Spring will get to you. I am hoping soon. Oh yes, the alphabet is gorgeous in Cherry Picker. My oh my, what a generous, wonderful gift from your stitchy friend. That makes your day! :D Waiting for Spring here in Wisconsin. Nothing but snow and ice. Two fabulous finishes, Carol! I really like the Cherry Picker one and look forward to seeing it framed. Congratulations on the giveaway win; what fun looking floss Arlene included. Here's hoping (and wishing) that spring is just around the corner. I just love when you post. Thanks for sharing. Love the Cherry Picker. I've been eyeing this one and I think you've helped me decide to do it! To me the imperfect basket is perfect with the sampler look. On another note, my one year old grand-daughter has said her first animal word: Squirrel. She loves books with animals and getting outside. What a fun post to read. It's good to catch up with all you have going on in your life and you have a lot!! What a generous gift from a fellow stitcher, it's like having Christmas in April. The cake roll looks yummy and so does the bread. Your finishes are all terrific. I hope it warms up for you soon, it seems as if your winter has lasted way longer than the six weeks predicted by the groundhog! Oh Carol beautiful finishes! Just love that little Santa! Your strawberry roll cake came out perfectly! I have been afraid to try that type of cake too! Cherry Picker is lovely, as is Santa. Your baking looks delicious, I might try a roll soon as they always look superb. A lovely collection of charts too. Congrats on the cute finishes Carol. What a thoughtful friend to send you those charts. Cake and bread are yummy! Love your two pieces. Honestly, only you would ever notice the slight change in the two DMC skeins after stitching the basket. Hand-dyed threads have so much variation anyway, that this would just look like it was meant to be even if anyone noticed. Your baking looks so yummy and a good thing to do when the weather has been so winter-like. I couldn't believe I felt the need to wear my winter coat when I went out to walk at lunchtime today. Wonderful gifts from your stitchy friends. What fun mail days! All your baking looks delicious. I just love the Santa finish. I am always looking for a cute way to finish off those great little stitches. It can be so hard to silence the inner perfectionist! I honestly would not have even noticed the difference if you had not pointed it out. I love the alphabet too, very pretty and unusual! Your bread looks delicious as does the strawberry roll! Marvelous stitching and finishing, Carol! I love the Cherry Picker design - the bird with his berry is adorable and I agree that the alphabet is just beautiful! Great ornament too! That cake roll looks delicious! 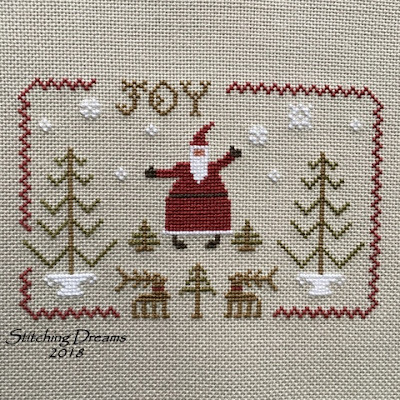 LaDaDa sampler is gorgeous and Santa is too cute. I have similar issues with DMC threads too. Congrats on your win, that is something I would stitch too. LOL, What fun mail you have, enjoy! Oh the cake look yummy. Thank you for sharing your little visitors, I always enjoy such nature wonders. Hi Carol....Your Cherry Picker is so beautiful....love the alphabet with all the flourishes! And St. Noel is adorable, but the finish is awesome! I hope that some day I'll be able to finish almost as well as you! Great giveaway to you and what generous gifts from one of your readers! I feel so sorry for that squirrel! What a lovely update Carol, you've been very busy! I love the Cherries Sampler and still can't see the difference in the basket floss colours even though you've pointed it out! The Joy Santa is so sweet, normally I'm not a huge fan of primitive designs but he is really cute. Thanks for the tip too of stitching the second leg twice to get the white to stand out, I will try this next time I have "issues". Please feed that poor squirrel, he looks so hungry! Such pretty finishes Carol,I love the way you display them to photograph them. The alphabet is beautiful on Cherry Picker. I could definitely eat more than one serving of your Strawberries and Cream Cake Roll. What a fabulous post Carol. The Cherry Picker sampler is just gorgeous, and the little Santa ornament is adorable. Hi Carol, thank you for mentioning the B5200 white floss and double stitching the tips of the snowflakes. I just stitched an ornament and had that issue of the snowflakes not showing up as much as I would have liked. This is so helpful to know. TFS. I do love the alphabet of the Cherry Picker pattern. Something a little different. Also love how you finished that sweet ornament. Cherry Picker is a beautiful finish, yes, the alphabet in a great one. I've been reading that a lot of people have been having the same problem with DMC, the quality has gone downhill, I think. Your ornament finish is so pretty also. How generous of your stitching friend to send so many nice leaflets. Mmmmm, that cake roll looks so delicious! I have made several recipes from Sally's, they are all wonderful recipes. That bread looks delicious also! We have the same problem with the Squirrels, they jump the suet feeder. We have a piece of PVC around the hook, but they still fins a way. So now we grease the pole with vaseline to deter them. Once they get it on their paws, they're gone! Yesterday I saw the 1st Goldfinch of the season. But the poor Robins are needing to find food. I think I will put some apple pieces out for them today. We have snow here too. Here's hoping Spring will come! Your baked goodies look SO scrumptious! The BB sampler is very pretty. I can see why you like the alphabet... it's really nice. And your ornament -- adorable!! It's always so fun for me to catch up on your blog to see what ornaments you've been doing. Love "Land I Love"!! Would you mind if I borrowed it when you're finished stitching it? P.S. "Spring" is here, too. We're under a winter advisory this morning... first rain, then sleet/snow, followed by snow. Forecasters are saying only a couple of inches of snow, but with frozen rain underneath... trecherous! And it means, I'll have to clear the driveway tonight. Good news, though -- 60F temps next week! That is such a pretty alphabet! I like the colors you chose as well - I would have changed the leaves to green, too! Your Santa ornament is very sweet. I never thought about just stitching the TOP stitch twice.... how ingenious. I'll have to remember that the next time I'm stitching over one and something isn't showing up well. When I stitch with two threads over one (on a low-count fabric) it just gets too bulky sometimes. The charts your dear friend shared with you.... how sweet! Looking forward to seeing future finishes. And that cake... wow! I think I'm as much in love with that gorgeous white plate it's on as the cake itself. Have a great week, Carol! Love your 2 stitched projects, look forward to seeing them ffo'd. It's always so lovely to see how you interperate a design to it's final finish, so inspiring. Love watching little birds that come to our bird bath outside our kitchen window. We don't have squirrels here in N.Z. I'm sure your Spring will arrive pretty soon. It's cooling down here quite a bit. Lovely finishes Carol. I agree with you about the beautiful alphabet. You have some generous friends . You know I'm not a baker , infact I have only baked 4-5 times in my whole life. But looking at your pics, I want to bake now. Spring can't decide if it wants to stay in Arkansas or not! Temperatures roller coaster from mid 30's to 80's almost daily!! I certainly agree with you on the beautiful alphabet in your cherry sampler. I've always wished that we wrote as people did in the past; all those fancy letters! Such a cute Santa ornament. I'm trying to keep up with my monthly ornaments and doing quite well. Just can't seem to find time to photograph them. Enjoy your spring! Gorgeous stitching, and your baking looks delicious! Your friend is very generous to send you all these charts. I hope spring will come around and settle in soon! I'll send you a few rays of sunshine. Cherry Picker is a great pattern, and you're right, a nice alphabet. Also St. Noel is again a nice pattern. What a great finish. This strawberry cream roll is delicious, that would be something for me. Homebaked bread is great, so you know exactly what's inside. Despite the warm weather, our squirrel and the little birds are still at the bird house every day to get something. How nice if you can watch them. I wish you a sunny weekend. Another great post! I agree that the Alphabet in the La-D-Da chart is exquisite! I like it! And your finished ornament is another wonderful one! The finishing is perfect too! Your strawberry roll looks delicious, as does your bread. Yummm... I am not into cooking much... no enthusiasm whatsoever! Thanks for sharing! Hugs! Another lovely post Carol, Beautiful stitching and I like the thread changes you have made, cute cherry picker and no worry about the difference in floss colours on the basket. Pretty alphabet and a very generous gift received which will keep you busy all year!. Too many tempting yummies while I´m sitting here with a lone coffee. the weather has perked up here at last. I do love that Cherry Pickers piece. It's gorgeous! You're like the second or third person I've heard say something about DMC floss not matching up. This is rather horrifying -- I'm so used to thinking DMC will always match! Sigh. All your baking looks yummy! As for spring -- well it was here for two days last week (Friday and Saturday), but then went away again. lol! Although I suppose I should be satisfied -- it's been in the 50s at least. lol! Yes, the alphabet is gorgeous, Carol! One of my favourites pieces from the Nashville market last year! Wonderful work! The April ornament is adorable! That Santa is to cute! Your cake roll looks so yummy! Love the Cherry Picker finish. The alphabet looks a wonderful script. Your ornament finish is another stunner. Love the fabrics you have used to compliment the piece - great Santa! The weather here over the pat few days has been glorious but tomorrow we are back to normal, 16C, grey skies and perhaps rain. Happy Spring! Ooo I would be hunting down the deer for eating the daffodils! I thought critters left them alone. Our grass is lovely to behold (dandelions and all) but the Mowing Season is now upon us. Watch us skip from winter straight to summer! That alphabet is lovely! I tend to make my f's look like that if I am not writing in cursive though most certainly not as neat haha. Wonderful finishes as always. Hoping for spring soon. We finally can enjoy the lake house, so now we need warmer weather to enjoy. Great finishes, and the alphabet is the first thing I noticed - it is amazing! I hope you’ve warmed up this weekend like we have, so nice to have the seasonal weather here and flowers blooming in the garden. Hope you had a nice weekend and have lots of good stitching time this week! Beautiful finishes, Carol! I need that Cherry Picker chart! It’s such a sweet design and I can’t believe I’ve never seen it before now.i love the little wren visiting your feeder. I see one every now and again and I’m thrilled! Carol: All your designs are lovely, I love your header photo. I look forward to seeing what you are into next. I feed the birds I love watching them feed and flit around. Congrats on the lovely finishes, Carol! The alphabets are beautiful. Lovely gift from your friend. The strawberry swiss roll looks yummy :) My daughter loves swiss rolls a lot but we always get from the store. Will try some day. Thanks for the links! at first, thanks for your comments! We have had problems with our internet, so I can't answer. But since a few days, it works!!!!! Your new post is really beautiful, my favourite is your sherry picker und the cake roll, mmmhhhh! 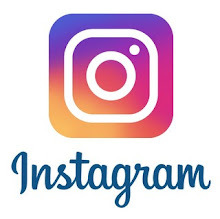 All your photos looks great!!!!! As always your stitching is really beautiful! Your cherry sampler is adorable and I agree with you about the alphabet is so nice... And your Santa...so cute !!! Hum !!! Your pie looks Yummy !!! this is really great !!! Such lovely edible and handcrafted delights to fill my mind with on here this time Carol. What a nice chart parcel your friend shared. Not really spring here either, way too much rain recently, although we did have a couple of warm days...was that Spring? What beautiful stitching! 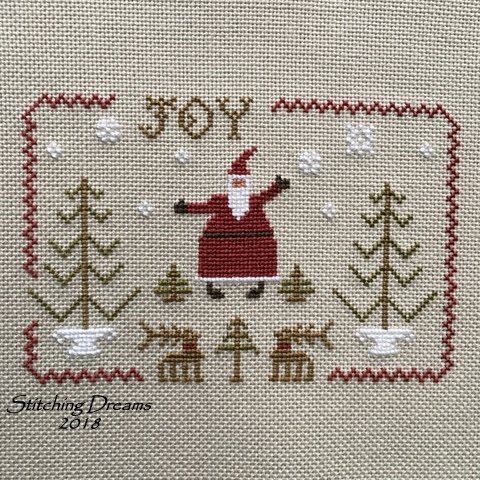 I just love your Santa piece and the finishing on it is great! Thank you for sharing your visitors! I love seeing the birds, even if you do have to deal with a squirrel now and then; though they get hungry too. We don't have to many squirrels here in Arizona but I do get a lot of hummingbirds at their feeders.